A couple of people have expressed interest in me continuing the blog after I get back from Dear Old Blighty. To those who have commented here, thanks for your interest. 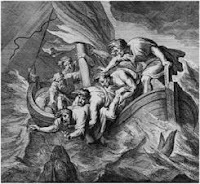 Here are links to the Internet Archive files of audio of the 5 Sunday School Lessons in Jonah - which was the last study that I blogged before bowing out. Think of it as a refresher or a primer. If you aren't familiar with the archive, all you need to do is click on the m3u if you want to stream audio to your default player. Or, you can play them in the site's native flash player. Alternatively you can click on the download link and get a zipped mp3 file. Finally, there are similar options for other formats (VBR m3u, VBR zip, Ogg Vorbis). You can't hurt anything so click away. These lessons are all read by an overweight, balding guy with a white beard, who doesn't look anything like the picture on this blog.